My wife and I love making extra income. Extra income allows us to diversify where our money comes from in case anything bad should ever happen to one of our main sources of income. Additionally, it allows us to spend a bit more money if we really want something that is outside of what we would normally consider spending money on. Unfortunately, many people think they don’t have the skills to earn extra income on the side. 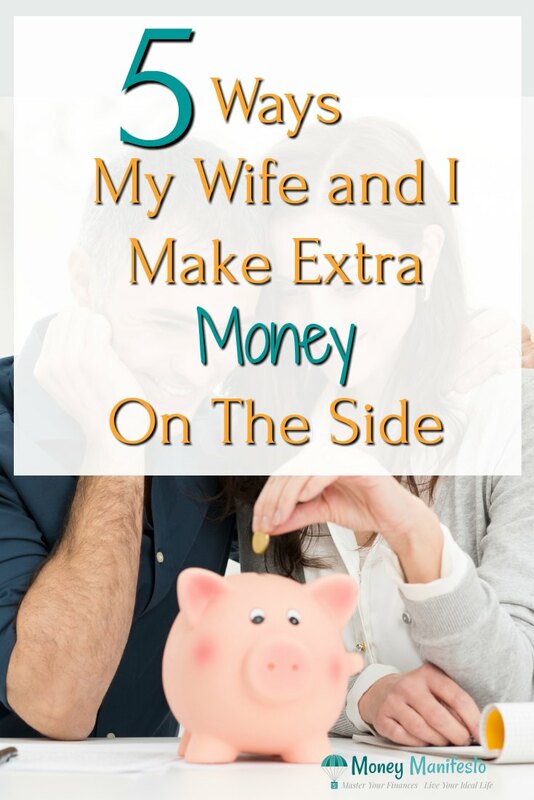 Here are just a few ways we make extra income on the side. Use these as inspiration to find your own extra income opportunities or use these exact ideas yourself. I’ve been writing for quite a few years here on MoneyManifesto.com. My writing here has allowed me to venture into freelance writing for other blogs and websites. On and off throughout the last few years, I’ve traded my time to write blog posts for others and they give me money in exchange. I honestly never thought about freelance writing until a company asked if I would be willing to write for them. However, now I realize that this is a great way to earn some extra money on the side. While technically anyone can start freelance writing at any time, it does help to have writing samples you can share with potential clients so they can see the quality of your work. In the beginning, you can prepare some examples yourself prior to applying for jobs. After you’ve landed a few freelance writing jobs, you can start using your published work. Alternatively, you can start a blog and use that as your portfolio. Pretty much everyone can write content for blogs if they put their mind to it. If you’re a big do it yourself project fan, consider reaching out to a do it yourself project blog. If you love cooking, consider reaching out to a recipe blog. The options are endless if you take some time to improve your craft and find the right clients. Even though I love writing about personal finance, my wife hates writing. Luckily, she loves taking photos and has started picking up freelance photography clients. She has taken photos for newborn sessions, family beach sessions and engagement sessions just in the short time since word of her work has spread. She bought all of the necessary equipment and software in advance and offered to do free sessions to build her portfolio. Now she’s at the point where word is spreading so quickly that she needs to raise her rates to protect her time, as well as to get paid closer to the true value of her work. You can make money by charging session fees, charging for physical prints of photographs or you could make money by selling the digital images themselves. I would suggest having a portfolio to show potential clients so they can get a feel for your style. After all, you only want clients that will be satisfied with your work so they will continue to spread the word that you’re an awesome photographer. I was hesitant to include this in the list, but we’ve made a lot of money through this blog since I started it years ago. While I don’t think anyone should start a blog solely for the purpose of making money, you can make a decent amount of money blogging. I currently make money through the ads you see on this site, as well as through some affiliate relationships which pay me if you sign up for their product or buy something through their site. Other ways people can make money blogging include selling products such as ebooks, meal plans or budget templates. You could come up with a subscription service that adds value to your readers’ lives. Just make sure that you stay true to yourself with blogging. Don’t sell out for a quick dollar. Your readers will know. In the past, I’ve made thousands of dollars a month blogging, but more recently I’ve just been making a few hundred dollars per month. I hope to grow this income back to prior levels over the coming months. Just remember, it often takes at least six months to a year before you make your first dollar blogging. Blog because you want to, not because you want to make money. Selling household items is a super easy way to bring in extra income. Whenever we replace a large item or want to get rid of something smaller, we consider a few different ways to sell it. Sometimes we’ll post an item on craigslist. If that doesn’t work, we normally wait until our annual neighborhood yard sale to sell the item. Of course, there are other ways to sell household items, too. You can sell smaller items on eBay or other websites and ship them to the buyer. Just make sure you insure the item and get paid before you ship the item. The easiest way we make extra income by far is through credit card sign up bonuses. Since we put all of our spending on credit cards anyway, we might as well have the banks pay us money to do so. Of course, we pay our credit cards off in full every month and never pay a penny in interest. We easily make at least $1,500 a year in rewards. Some of these rewards are a credit on our statement while others will direct deposit the rewards in my checking account. Other times, we use our rewards to pay for our vacations like a cruise. All we have to do is calculate our future spending and make sure that we get a credit card that allows us to qualify for the sign up bonus in the proper time frame. For instance, many cards offer a bonus, sometimes as much as $500 or more, if you spend $3,000 in 3 months. We can easily do this if one of the months includes our 6 month auto insurance premium. In years where we have unusual spending, such as buying furniture or upgrading our home, we can get even more credit card rewards and sign up bonuses due to our higher spending. If you want to earn credit card sign up bonuses too, make sure to check out my list of the best credit card sign up bonuses available this month. Some of them are worth over $500 in value. As you can see, my wife and I make extra income in quite a few different ways. I honestly believe there are thousands of ways to earn extra income. If you’re in a tight spot financially, find a way to make more money. You’ll be glad you did. What ways do you make extra income in your life? Do you do earn side income in any of the ways I described above? Which is the easiest for you? Which is the most difficult? Let me know you thoughts in the comments below! Nice Lance! Its amazing what a little side hustle can do for you in the long-term if you are good enough to make sure you set that money aside to grow. Making an extra $1,000-$10,000 per year is totally achievable, and could put a huge dent in the money you need to retire early. Thanks for sharing my link if your recent email! Side hustles are indeed awesome! No problem about the newsletter link. Awesome content deserves to be linked to! Congrats to you and your wife for working the side income hustles. Has the freelance writing been working out well? I’m still trying to use my blogging skills to my advantage to pull in +$1000 per month. I have made money selling items online and by blogging. Looks like I’ve got some work to do. Nicely done Lance. I recently threw everything up on Craigslist which I wasn’t using regularly. Talk about a freeing feeling! Yes it is. You get rid of the junk in your life AND you get money in your wallet. Win Win!